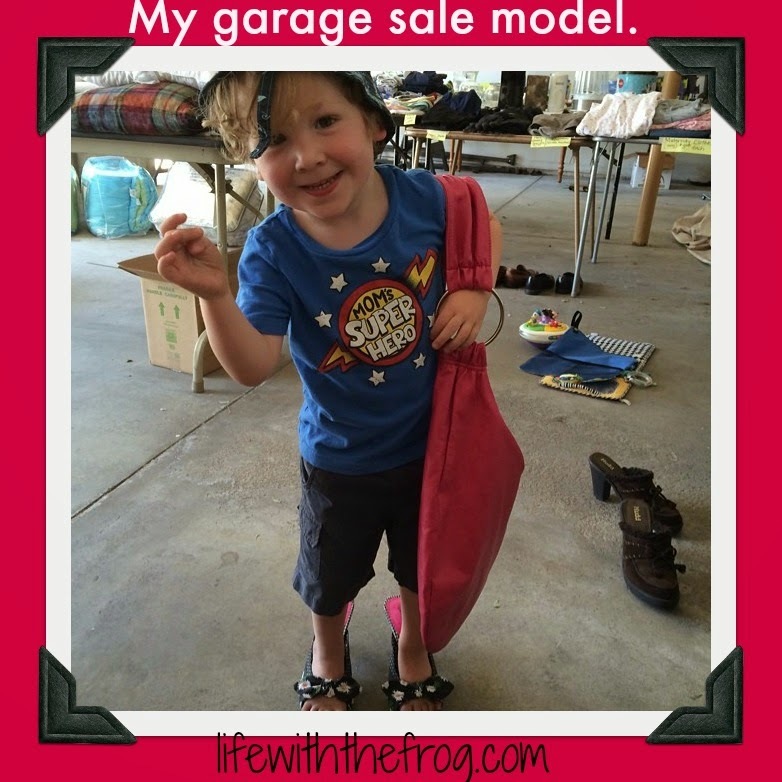 This past weekend, I completed the all-American rite of passage: the garage sale. In preparation for our upcoming move, we had to purge the house of all the things we've been saving, but have never used (like the bar stools from our first house - three houses ago). Everyone said it would be a lot of work. Everyone said I wouldn't make much money. 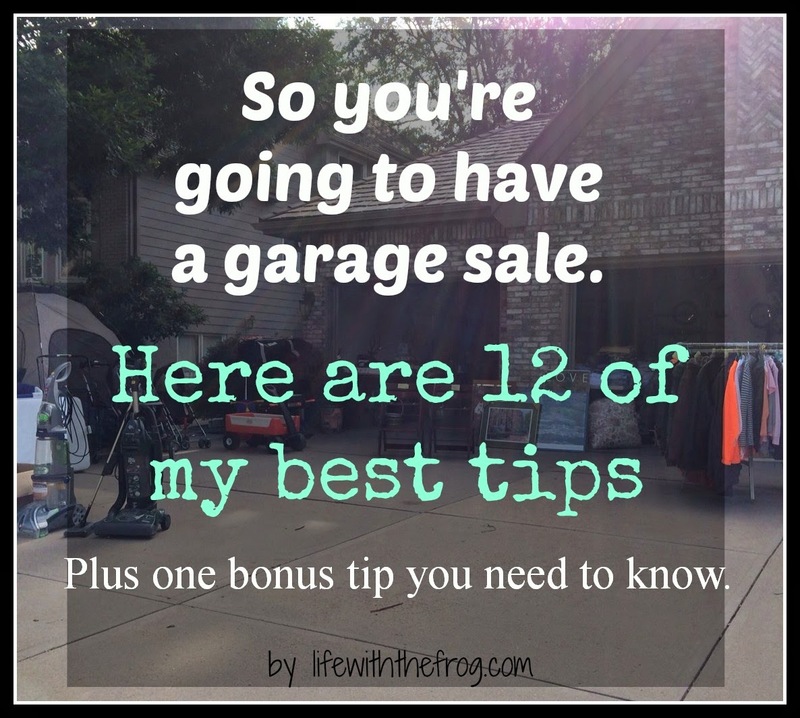 Everyone had a horror story about "certain types" of garage sale shoppers. But I was determined to make some cash from our unneeded items (truth be told, last winter I had a SNAFU with my van and it had to be fixed - to the tune of $1,600! I made half of that at my sale.). So I scoured the house and made piles and sent panicked e-mails the week before the sale. Now that all is said and done and I only have to call the donation pick-up service, I thought I'd share some things I learned. 1. Make piles of like items as you collect them from around your house. This will speed up the organizing process tremendously. 2. If you can, tag items beforehand. I didn't do this, so I was kind of scrambling a couple days before the sale. This is where the like groupings came in handy. I put signs on tables instead of on individual items. To see what the going price for items is, you can either Google the item or check garagesalestracker.com or bestgaragesaletips.com. 3. Enlist the help of family and friends. On the Saturday before the sale, some of Hubby's large family came over, brought tables, helped carry up items and lay them out on tables, and generally kept me in good spirits as I worked. My mom and mother-in-law also helped work the sale, and Hubby had the days off, so that helped immensely! 4. BUT, don't expect people to drop everything and run over to help you. Even if you've babysat their kids, helped them move, or helped with THEIR garage sales. People have their own lives, you know! 5. Display your items neatly with enough room to walk around and look. You want to make it as easy as possible for people to shop. 6. Be okay with people pawing through your possessions. Remember, you don't want them anymore. 7. Be okay with bartering. Depending on what your end goal is - do you want to make money or do you want to get rid of things - be willing to come down in price. People are looking specifically for bargains. I purposely priced some items high so I would be okay with coming down in price. 8. Don't assume people are trying to rob or cheat you. There is a certain cultural subset in our city that goes to garage sales a lot, and they are stereotyped. I found these people to be sweet and kind and willing to pay the asked price. If they asked for a lower price or counted their money in front of me and it didn't add up, I was generally willing to bring down the price. We were selling some nice items; and if someone could use something, I wanted them to have it. 9. Greet and talk to every person who comes in your driveway. I worked in retail for nearly eight years, and this is rule number one. It's so much easier for a customer to turn around and walk out with nothing if they are ignored than if someone acknowledges them. Truth: not many people left my sale without at least one item. 10. Just know that some items will come back in your house. Whether it's because your kids drag them back in (I'm still finding Hot Wheels cars I swore I put in the 10 cent bucket!) or you change your mind and decide you can use it after all. You will be a little sad to see some items go, and others you will be begging people to take. 11. Thursday is your biggest day. But don't forget about Saturday, too. Most garage sale regulars go early to get the best items. But some people work or just want to see what you have left. If I did this again, I'd do a full-day Thursday, and half days Friday and Saturday. 12. Bag it up right after the sale and call a pick-up service. If your goal is to clean out your house, DON'T bring it back in!! If you are willing to have another sale and have the room to store items, then keep them organized for next time. And keep a list of what you have and it's value for tax purposes. And finally, for the Baker's Dozen . . .
13. If you have the radio playing, just know that you will hear Ariana Grande's "Problem" approximately 1,472 times in three days. But hey, every time something leaves your garage, you'll be singing, "I've got one less problem without you." Do you have any tips I didn't mention? Leave them below. And good luck on your sale!